When you want the new hotness coming out of Apple, one of the ways to justify your expensive purchase is to resell your existing Apple products. The good news is that Apple devices hold their value really well. The bad news is it’s tedious to figure out what your devices are worth. Traditionally I write down all of the specs of a machine, and then go over to eBay. I search for the same device on eBay while setting the filter to sold items only. Then I create a spreadsheet and start recording the last 10-12 that have sold recently. I keep detailed notes in my spreadsheet on how they might vary from the one I’m trying to sell. I throw out the super high ones, which are usually those sold by a company. Then I throw out the lowest one if it’s got something clearly wrong with it or it has something fundamentally different spec-wise from the one I’m selling. I average the selling price in my beloved Excel to determine a price. If I’m selling to a stranger, that’s a fixed number, if it’s to a friend who maybe could use a little bit of help with the price, I’ll lower it a bit. At least I know the value of the equipment, but this process takes 3-4 hours. 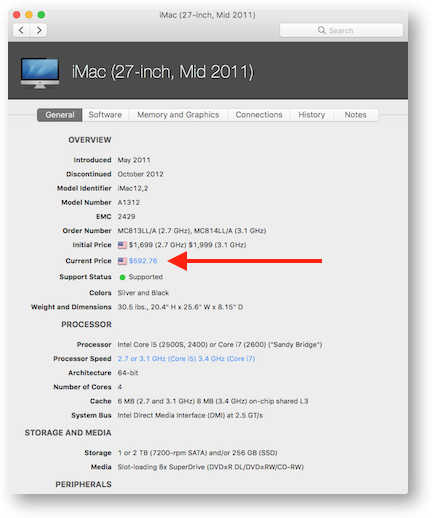 MacTracker has been around forever, but it’s continued to get better and better over time. The developer now includes all desktops, laptops, iPhones, iPads, Apple TVs, Airport routers and more. You can find out everything about these devices, up to and including hearing their original startup sounds. It’s super cool. But that’s still not the Tiny Tip. HERE’S the Tiny Tip. I looked up Steve’s iMac model in Mactracker and I noticed something new. The Initial selling price was there, but below that was “Current Price” with a US flag next to the price. Boom, you know the current selling price! But wait, there’s more. I noticed that it was in blue, so I clicked it. I got a prompt asking if I wanted to open the link in a browser. I trust Mactracker, and it was awfully sweet of it to ask permission so I allowed it. The price link in Mactracker took me to a site called bidvoy at us.bidvoy.net. Now here’s the really cool part. Bidvoy shows you the price over time. There’s a pulldown to choose from some standard time frames from the last 6 months to 2 weeks, or you can set a custom range. The data points even have a trendline through them. Below the graph you get the average over the last 6 months (which is the number you see in Mactracker). You can see the weekly trend, how many auctions and the price margin. Not sure what that one was. Below that you can even see the best time to purchase based on this historical data, and the best time to sell. For Steve’s model, you want to buy on a Sunday between midnight and 4 am, and I should try to sell it (if I’m doing an auction) on a Tuesday between 4 and 8 am. They show the prices for those two times, but it doesn’t entirely make sense. The average for Steve’s iMac is shown around $600. The best time to sell says almost $800, but the best time to purchase says $650. I would think that the average should be between the best time to sell and buy, wouldn’t you? Still interesting. But bitvoy isn’t done yet. After the graphs, you can see a list of the same model currently-selling on eBay. For each one they show the current bid price (or buy it now price), the time left, and a red, blue or green badge telling you if it’s underpriced, normal, or over priced. If you see one that strikes your fancy as a buyer, you can click on it and go right into the sale on eBay. One caution on using Mactracker and bidvoy. While this is easy, if the Mac you’re buying or selling isn’t the average model, the price you see here will not be representative. For example, in looking at the current auctions, I realized that this includes not just the i7 version I bought for Steve, but also the i5’s that are less valuable. I cranked up the RAM and disk when I bought it for him, so that should be taken into account too. Using Mactracker and its connection to bidvoy is a great starting point and can get you most of the way there with the simple click of a button. 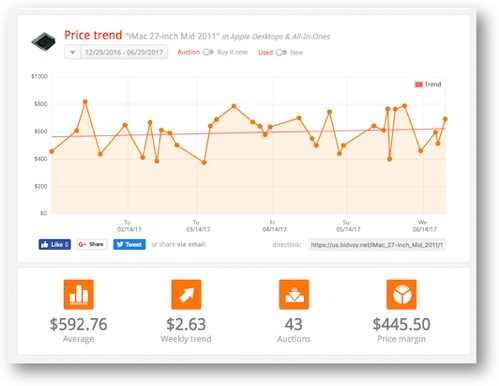 I should mention that the iOS version of Mactracker doesn’t have this current price feature, so you’ll need to view it on a Mac. I’ve just realized that the definition of a Tiny Tip is that it could be described in one sentence or two but that doesn’t mean I can’t make a lengthy post about it anyway! Well, actually, since Macs run on a foundation of BSD-Unix, and OpenBSD is still actively supporting now really old PPC based Macs hardware. I guess it’s possible. Just not happening. But Bart did have an economic recommendation the MacTracker pricing App may (or may not!) help. I’m not trying to put words in Bart’s mouth (even if it looks like it above), so maybe he could weigh in with more specifics as to when he thinks it”s best to sell and replace with new? Interesting Tip Allison. Mactracker is one of my must have apps on all my devices. I have the same model iMac as Steve’s, optioned up with 20GB of memory and have inserted a 500GB SSD behind the optical drive, leaving the 1TB hard disk in place, so it is far from standard. I was interested to see what it was worth, but as I live in Australia the “Current Price” option was not available until I changed the currency to US dollars. Having done that it found an iMac for sale locally for $242. It must not list them for all devices. I clicked on two items (one being a 1st gen Apple Watch) and it only shows “initial price”. No used price is listed.